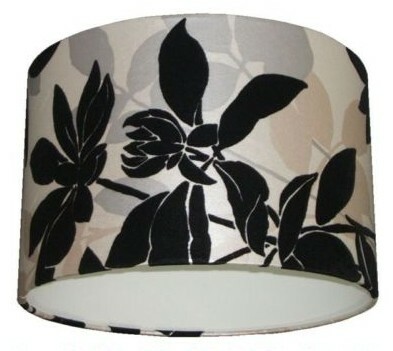 This lampshade is handmade to order using a L.Llewelyn Bowen flock wallpaper ‘Velvet Undergrowth’. A beautiful leaf trail design in real black flock and metallic gold and silver on pearl background. The pattern continues right around the lampshade and top and bottom edges are hand rolled so that the pattern continues beyond the edge.